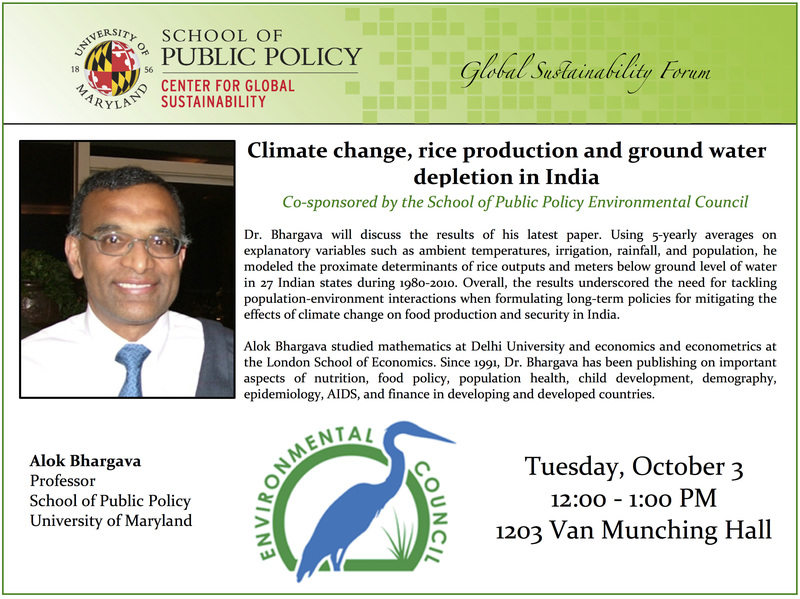 Dr. Bhargava will discuss the results of his latest paper. Using 5-yearly averages on explanatory variables such as ambient temperatures, irrigation, rainfall, and population, he modeled the proximate determinants of rice outputs and meters below ground level of water in 27 Indian states during 1980-2010. Overall, the results underscored the need for tackling population-environment interactions when formulating long-term policies for mitigating the effects of climate change on food production and security in India. Alok Bhargava studied mathematics at Delhi University and economics and econometrics at the London School of Economics. Since 1991, Dr. Bhargava has been publishing on important aspects of nutrition, food policy, population health, child development, demography, epidemiology, AIDS, and finance in developing and developed countries.